In the complicated lives that we are all living today, we tend to forget the beauty of the word simplicity. In such times, it is important to value simplicity and simple lifestyle habits which come completely free of cost! A simple practice like deep breathing has a positive influence on your life and health. Similarly, going for a walk is an activity which has many health benefits, is simple and free of cost. In this article, we talk about the many health benefits of jaljeera – a simple drink which you can have anytime of the year. Jaljeera essentially includes water (jal) and cumin (jeera), and is extremely cooling and refreshing drink which is good for your health. Jaljeera is traditionally made in a matka (mud clay pot). This makes this water concoction more alkaline in nature. Jaljeera is made with roasted cumin powder, ginger powder, coriander leaves, mint leaves, dried mango powder and much more. These spices are all commonly found in Indian kitchens. All of these can help in dealing with indigestion, gas, bloating, flatulence.Jaljeera is beneficial for health as it helps in stimulating digestive enzymes, thus improving digestion. Jaljeera helps in aiding digestion and reduces incidence of bloating and flatulence. Adding mint in jaljeera can help cool the stomach. Make sure you add either black salt or pink salt and avoid adding refined salt to your jaljeera. 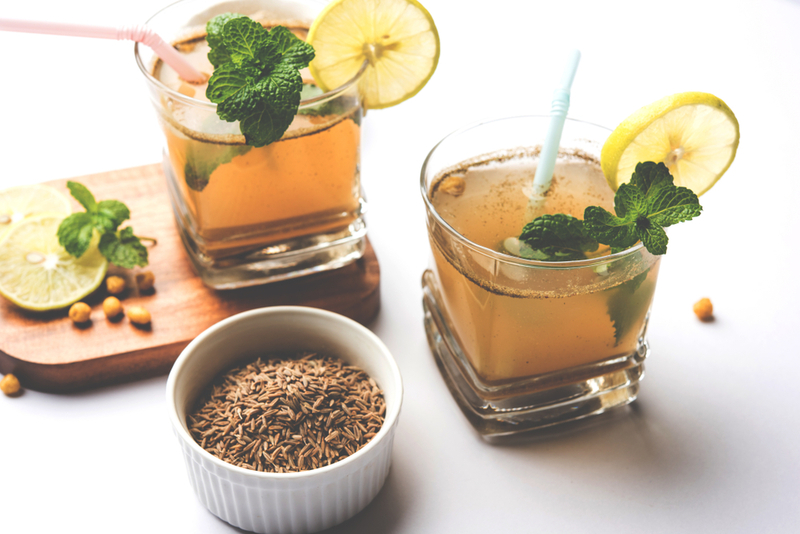 This drink is also beneficial for people with anemia, as jeera is a rich source of iron. Jaljeera is also great for keeping you hydrated. In times of rising air pollution, having a drink like jaljeera is going to be helpful as it is good for your respiratory system. Combination of spices and herbs in jaljeera helps in breaking down mucous. Try jaljeera in lukewarm water or hot water if you have cold and congestion in your chest. Sipping on too many liquids while eating meals is not suggested. Also, you should not drink water around half an hour before having a meal and 30 minutes after a meal. Add this simple drink to your lifestyle today and reap in its many health benefits. « What is your Happy Weight?